© Bethel Woods Center for the Arts. 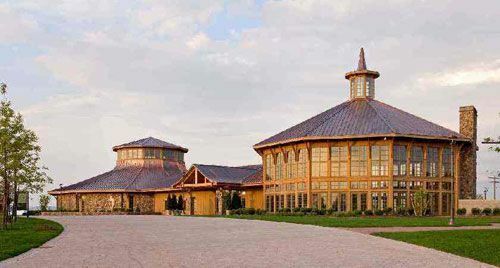 Visit Bethel Woods, home of the Woodstock Festival Museum and outdoor live-music concerts. Better known as the Woodstock Festival Museum, the Bethel Woods Center for the Arts is a museum and outdoor performing arts center. Located approximately 90 minutes from New York City, the Bethel Woods Center for the Arts stands on the site of the original 1969 Woodstock festival in Bethel, NY. Personal stories and profiles, multi-media exhibit displays and experiences, programs, and educational events are part of the experience. The $100 million dollar facility aims to put into context not only the impact of the legendary Woodstock Festival but also the culture, style, and ethos of the Sixties generation. 1960s timeline on display at the Bethel Woods Center for the Arts. Advances in civil rights, female sexual freedom, music and other elements fed into the cultural changes of the 1960s, as documented on this timeline at the museum. Rain, mud, dirt, thirst, music and LSD trips characterized a lot of the Woodstock Festival. This immersive Woodstock Festival Experience exhibit in the round attempts to replicate some of the sights and sounds of the 1969 three day event. The journey was as much of an experience as the Woodstock Festival itself. In 1969, some festival-goers traveled by VW Beetle, many hitchhiked, stars flew in on helicopters, and some groups descended on buses. Throngs were so heavy to reach the Woodstock Festival that the New York State Troopers closed down the New York State Thruway for a period of several hours. The original psychedelic bus belonged to the Merry Pranksters, a commune that traveled from California to New York and pack, dropping acid as they went. Directions for those traveling to Bethel Woods are here. Today buses operated by Trailways are one means for traveling to reach Woodstock, NY. The political ethos of the late 1960s was focused on the effort to stop the war through conscientious objection and antiwar marches. Pins with antiwar slogans were collected and worn by kids on their clothes, backpacks, hats, and everywhere else they would stick. Before the iPod, before the Internet, portable AM-FM transistor radios connected teens with the sounds of their generation. Often worn as a sign of protest against the Vietnam War, American flag clothing was popular in the 1960s. Standard hippie regalia, circa 1969: American flag shirt, fringed accessories, love beads, and granny glasses. It cost $18 for three days' admission to the 1969 Woodstock Festival. When the crowds turned out to be far larger than expected and new arrivals surged past gates, the promoters gave up on collecting a ticket from attendees and turned Woodstock 1969 into a free concert festival. The terraced stage outside the Bethel Woods Woodstock Museum provides amphitheater seating without sightline obstructions. At the smaller Pavilion stage, a roof protects performers and ticket holders from the elements. If not for farmer Max Yasgur, the Woodstock Music Festival might not have taken place. Two Catskills villages refused to accommodate it; he opened his field. Built to accommodate large, music-loving crowds, the Bethel Woods Center for the Arts pays homage to Max Yasgur and the Woodstock Music Festival that turned this rural corner of New York State into a place known throughout the world.